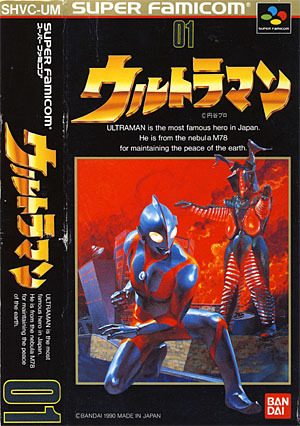 Ultraman is a side-scrolling fighting game, an conversion of Bandai & Banpresto's arcade game originally released in 1991. 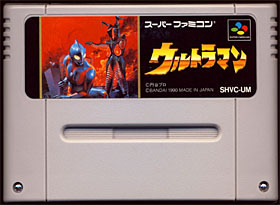 The major pop culture phenomenon has spawned countless adaptations and spin-offs since its first broadcast in the 1960s, and it didn't take long before a game featuring the Ultra-Warrior was released for the popular Super Famicom system. In the near future, the Science Patrol organization is created to fight constant waves of giant alien monsters who threaten life on Earth. Hayata, a member of the organization, has the secret ability to transform into Ultraman, a powerful fourty meters tall super-human. A mysterious item called the Beta Capsule allows him to revive Ultraman for three minutes, and this until his body energy depletes completely. A warning light located on his chest goes from green to red, alerting Ultraman of his energy level. The game features a total of ten one-on-one battles where Ultraman faces several monsters from the popular TV Show. Our hero can use various punches, kicks and grabs, but also rolls and jumps. He can also charge up special attacks such as the traditional Ultra Slash, Specium Ray and so on. Once an opponent's energy bar is at its lowest, the monster has to be finished off using the special attack powered up at its maximum charge. During the game, both Ultraman and his enemies recover health over time - the battlefield's wideness often gives our hero the opportunity to regain his life and get ready for his next attack. The original arcade game, called Ultraman Kūsō Tokusatsu Shirīzu was released in 1991 in Japan by Banpresto and Bandai (picture on the left). The game is fairly identical to the Super Famicom version tested here - same menus and same overall graphics. In that respect, the Super Famicom version tested here is an excellent conversion. As a side note, the game was also ported to the Game Boy (1991) and Sega Megadrive (1993). Gigantic and treacherous aliens are invading Earth. They're destroying our cities and leaving a path of chaos around the planet. There is one humongous hero powerful enough to eradicate there creatures... Ultraman !! Part human, part super being, he's got what it takes to eliminate the evil aliens once and for all. Ultraman uses his special weapons along with martial arts, wrestling, and street brawling skills to fight off each attacking monsters. This game utilizes its 10-Bit power to its fullest. Really large characters, detailed landscapes, realistic sound effect and music that are gonna knock you out !